Tomatoes preserve well. Freezing tomatoes is easy. Painless, even. (Especially if you own a high-powered blender like a Vitamix and like them pureed—which I do, since I use them in sauces and soups all winter). 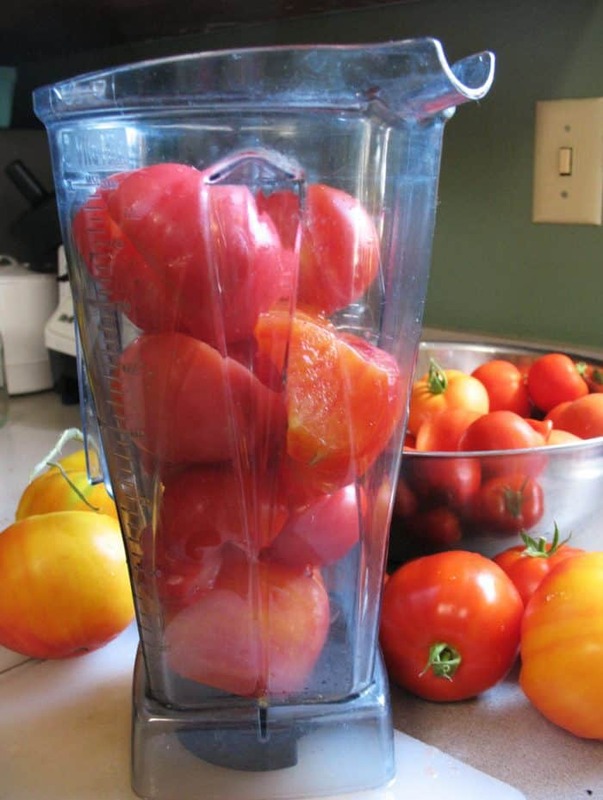 The Vitamix purees the tomatoes in such a way that no skinning beforehand is required. It also works wonders (and the same way) for making pureed applesauce (which is great since there’s essential vitamins in the peels). If you want, you can add spices, etc. to the tomatoes before freezing, but I usually don’t do that. I wait until I thaw them and add ingredients fresh when I’m cooking. Another simple freezing technique is to freeze the tomatoes whole (or in large chunks) with the skins on. 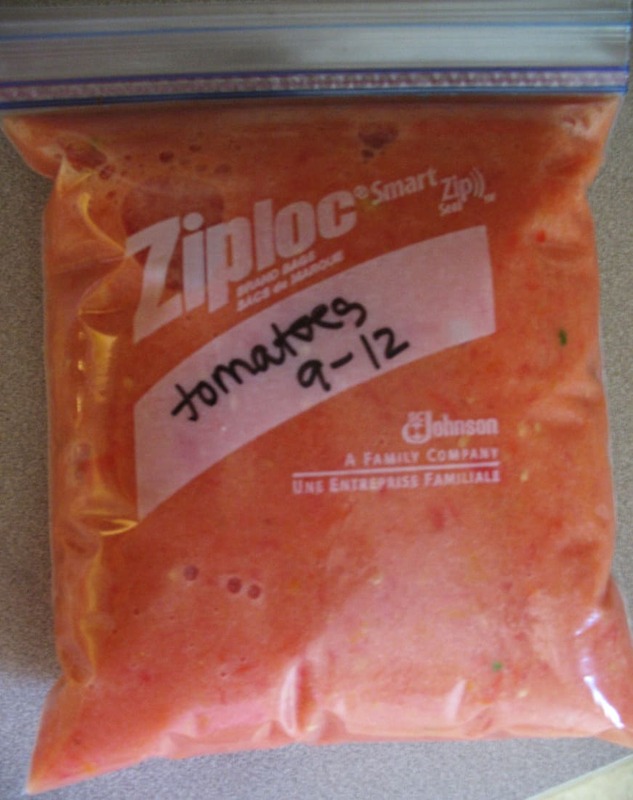 In the thawing process, the skins will slip off the tomatoes effortlessly. 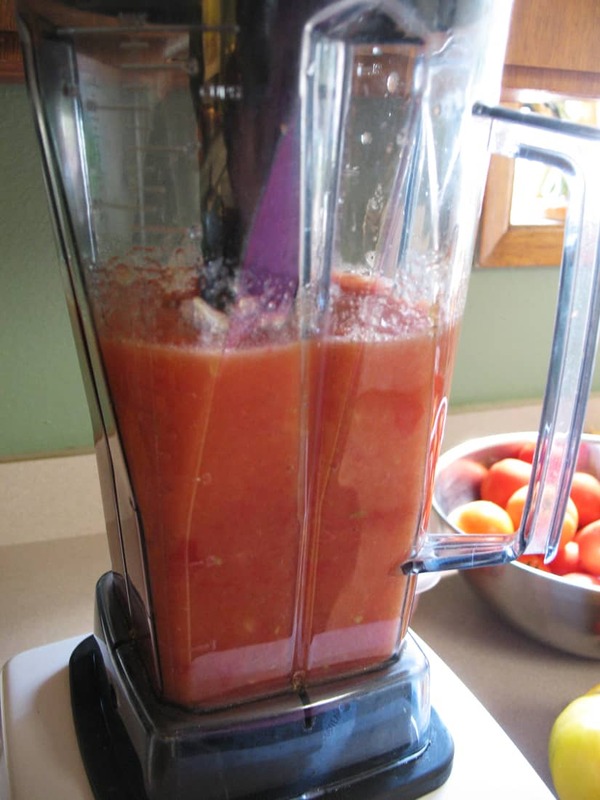 This technique is good for people that don’t want to take the time to blanch the fruit, and also don’t want completely pureed fruit, but like to cook with chunky tomatoes instead. A bonus for doing it this way is that you can take the SKINS (when you thaw your tomatoes) and simmer them down to a most excellent tomato paste (as you thaw and use the frozen tomatoes, slip the skin off and stick them in a bag in the freezer to save until you’ve got a pile of them to do this with). 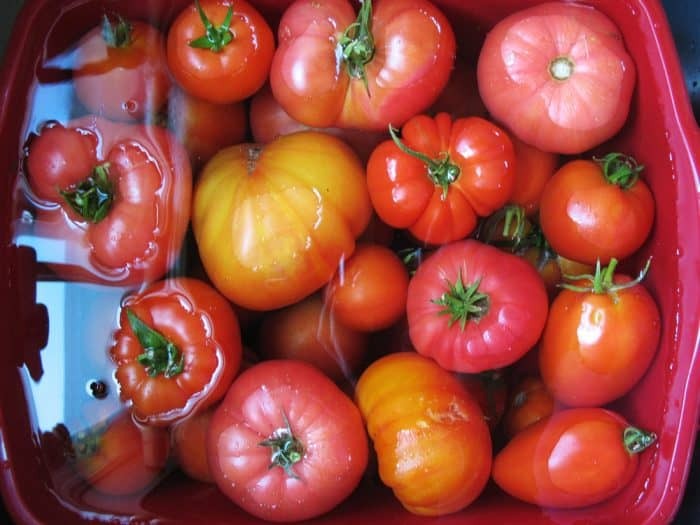 If you prefer to skin your tomatoes first, this is an easy extra step that just requires a pot of boiling water and a bowl of cold (even iced) water. Simply dump the tomatoes into the boiling water for a few seconds (up to about a minute). Once you see the skin split, pull the tomato out and plunge it in the cold water. This will allow the skins to slide right off with little effort. From there, you can decide how you want to prepare the skinless tomatoes—whole, chunked or pureed. 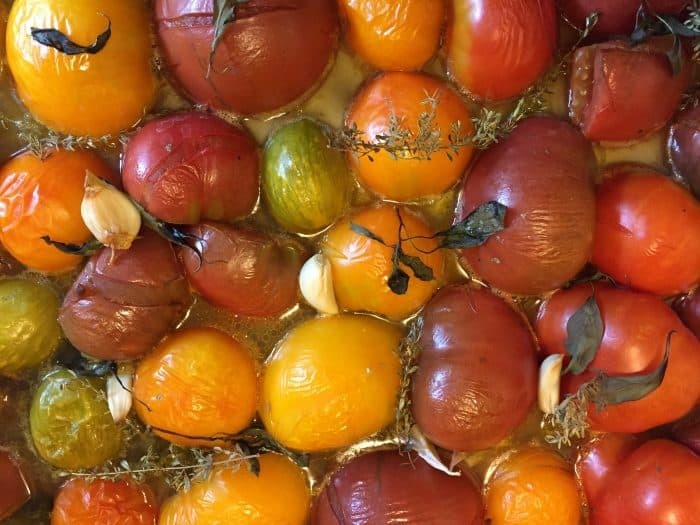 Clean and half your tomatoes (and cut the core out) and place them on a baking sheet that has a thin layer of olive oil on it. Add tomatoes in a single layer. On top of tomatoes add whatever fresh herbs you want: Rosemary, thyme, basil, garlic, etc. Drizzle more olive oil on top. Roast the veggies at 400 degrees for about 30 minutes. Cool, pick all the herbs, etc off and freeze. Again, if you freeze them with skins on, they will slide right off when you thaw them later. (And this method gives your tomatoes a wonderful added richness to use in recipes later in the winter.) Bonus points: The house smells WONDERFUL while they’re roasting. Mmmm. 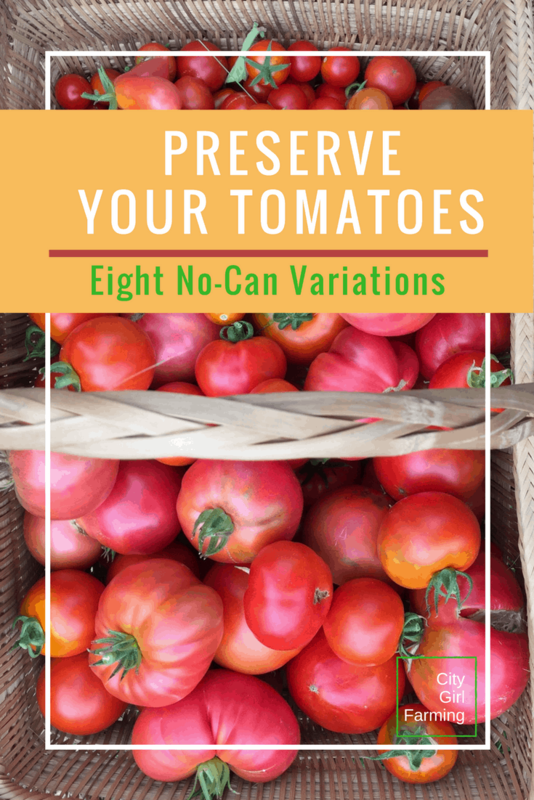 Of course if you’re freezing tomatoes, you don’t have to worry about closely following any recipes (like you do with canning)…so have fun and experiment. 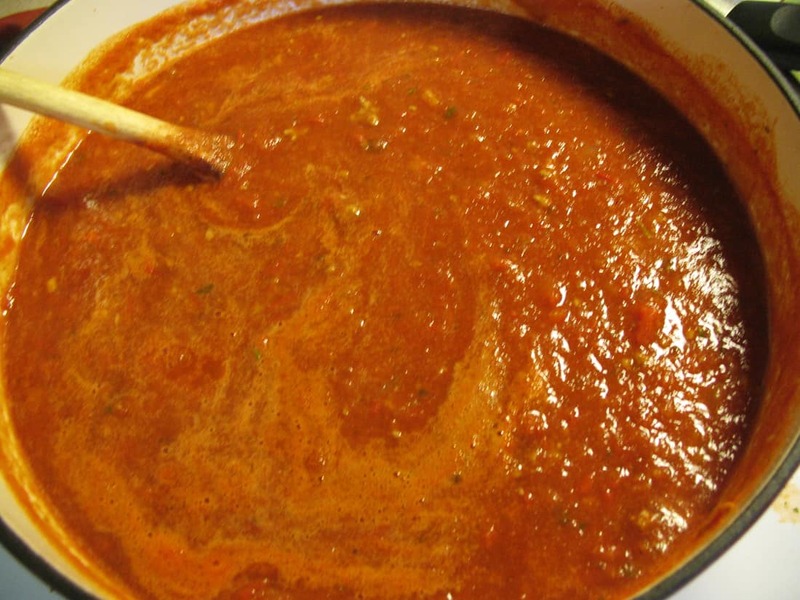 As I quickly pureed my tomatoes for the freezer yesterday, I also made a massive batch of spaghetti sauce out of veggies from the garden: tomatoes, onions, garlic, basil, thyme and Italian parsley. I also added a splash of red wine, some tomato paste and some organic Italian sausage. Mmmmm. 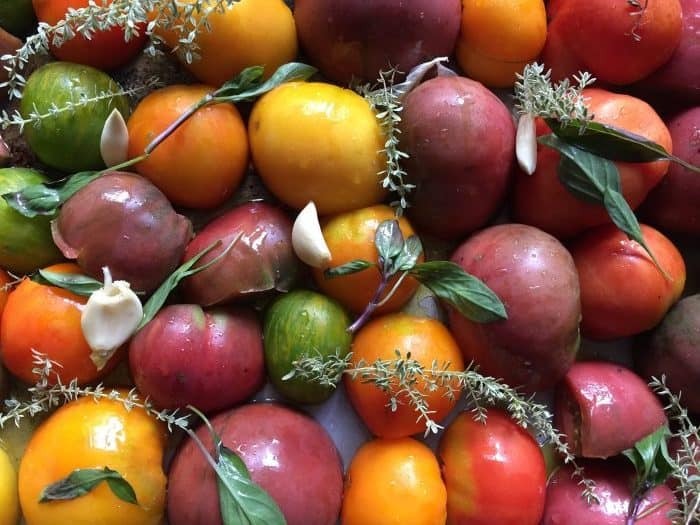 Working in a kitchen with the smell of fresh pasta sauce, while freezing quarts of tomatoes in record time, I was feeling blessed to live in a place where I can have at least a few tomato plants, even if the weather doesn’t always full cooperate with their ripening. Fresh spaghetti sauce for dinner! Mmmm. This year the tomatoes are full-on, though, and I plan to make the most of it! What do you do with all your tomatoes?